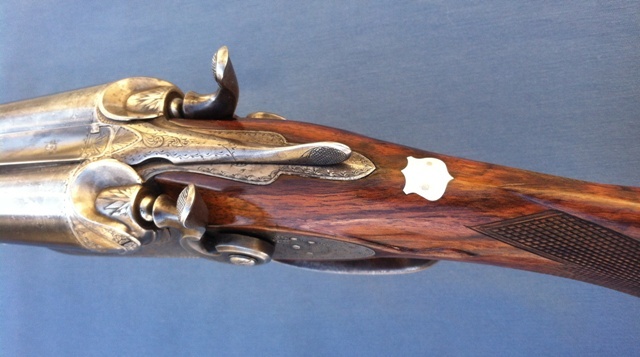 This fine Parker hammer gun had at one time its checkering worked on by an untrained hand. 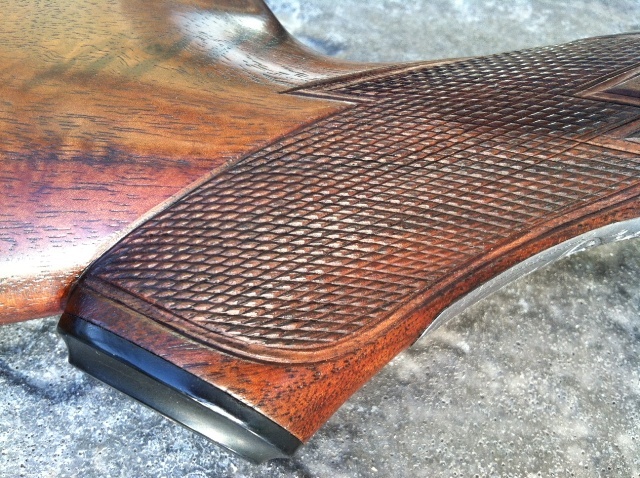 The forend had an attempt at a full cover checkering pattern, which got badly out of control in the rear section. And the wrist checkering was full of over runs and the patterns did not match from one side to the other. Also, details in the wrist area were worn out with age. Such as the drop points and the pointed “hump” on the top of the wrist was nearly indistinguishable. Below are before photos. The forend was beyond repair and needed to be replaced. New checkering in the correct grade 3 pattern was laid down on it. 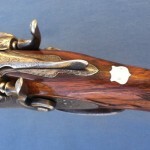 The wrist of the buttstock was able to have the old checkering removed completely and in the process, the drop points and other important features were able to be re-defined. 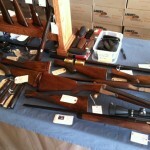 The buttstock was refinished and new checkering cut in the wrist. Below are final photos of the result. 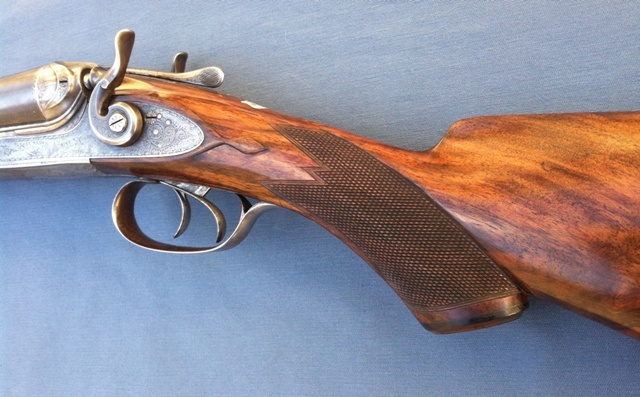 This subject grade 3 hammer gun is the PGCA 2014 raffle gun. Tickets are available for sale. $5 each or a book of SIX for $25. If you are interested in purchasing tickets, please contact me. Or inquire with the PGCA directly. Making a Parker BTFE right again. 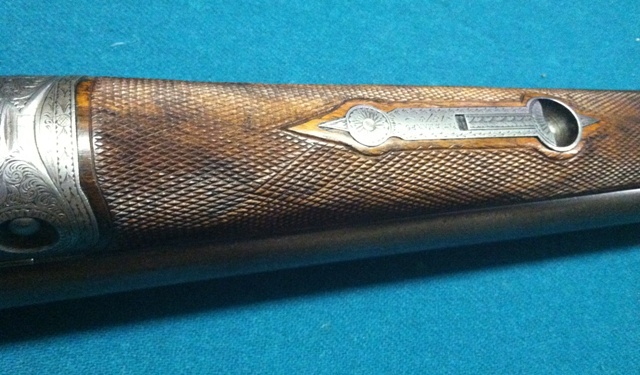 This fine Parker CHE had at one time had a non original Beavetail Forend (BTFE) added to it. 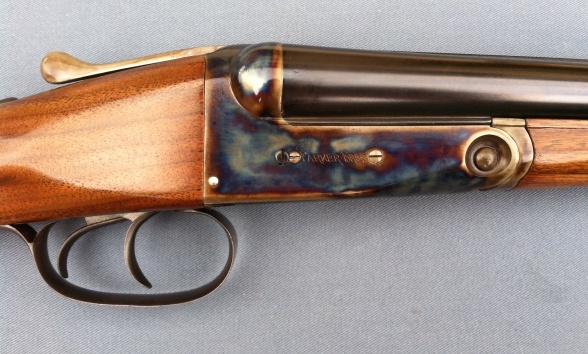 A proper forend iron was fabricated for it, which utilized the draw bolt in the nose of the forend. 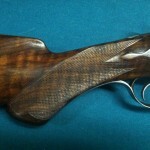 However the forend wood itself was the issue. It was very fat and had a large belly on it. The latching mechanism had crude alterations done to it and the forend had a hard time staying on the gun under recoil of firing. 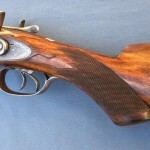 The finish of the wood was also very dry and the checkering was in no way correct for the gun. The below photo shows the forend in its beginning state. The forend latch lever and also the locking key had to be replaced due to the crude alterations that had been previously done to them. 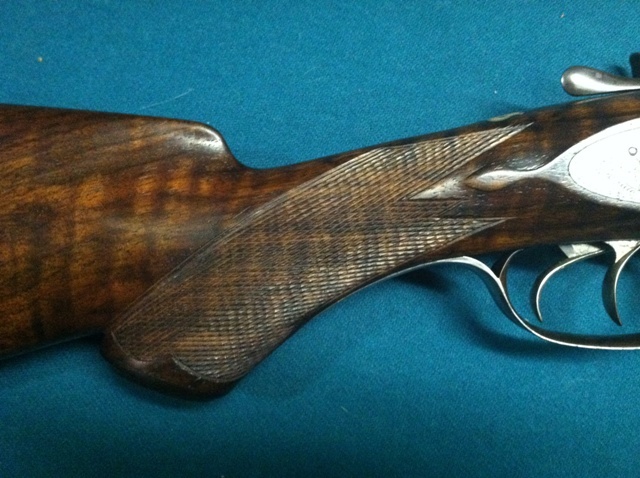 The Forend wood was able to be reshaped into a proper form for a Parker BTFE. 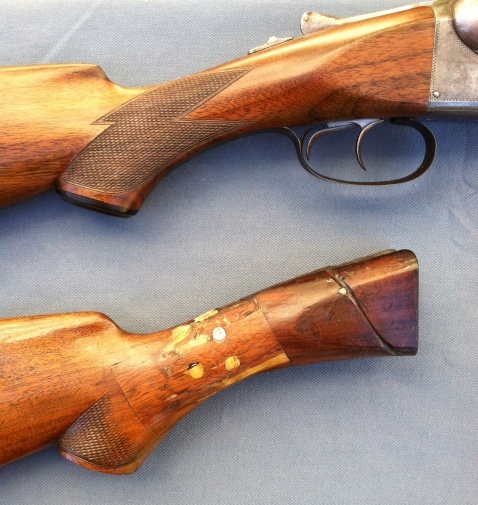 The belly on the bottom was removed by ferther inletting the forend latch by about 1/4″. 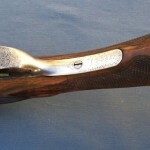 The sides were slimmed down and the nose reshaped to make a very pleasing forend on this fine gun. And finally, proper checkering was added to complete the job. While checkering the stock of a custom built low wall rifle I decided to take the opportunity to document the process and share it here. The first step of checkering any stock is laying out the pattern. Be it a replication of an original pattern or a custom creation for a one of a kind stock, the step is crucial. When replicating original patterns, paper templates made from rubbings of original patterns can be a helpful guide for laying out. However, every single stock is different and no two patterns are identical. A wax pencil and flexible rulers are used to lay out the design. After the design is layed out, the master lines and a few border lines can be cut into the stock. The above photo shows the master and border lines for this low wall stock. The upper and lower border lines are parellell to each other. The rear border serves as a master line, while the other master line is the border of the lower leading point which carries towards the back of the pattern. It is critical the the master lines be straight since all of the pattern follows these first two lines. Note that the front of the pattern is left open with no cut lines. Next, spacing of the lines can begin. For this pattern, I am using a 24 line per inch cutter. The tool follows the previously cut line while also cutting the next one. All the spaced lines follow the two master lines. Refering back to the previous section where I mentioned how the front of the pattern was left open; you can see in the photo above how the front of the pattern is now closed in as the upper leading point was defined by the cut lines that spaced off the rear master line. One of the most important things in working a checkeirng pattern is to learn when to box yourself in and when not to. The front of the pattern is being allowed to take form on its own. I wanted there to be a center point at the front of the pattern, so as I complete the spacing of the lines that point is added. The above photo shows the pattern fully spaced out. The next step is to deepen all of the lines in order to point up the diamonds. The above photo shows the pattern fully cut and pointed. It takes about 3 to 4 passes over each line in the pattern to bring the individual diamonds to the full point. First they are deepened with a 60 degree cutting tool and final pointing up is done with a 90 degree cutting tool. 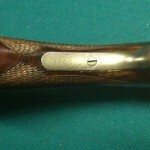 Some factory checkering on low grade guns are not fully pointed. For this pattern I put a single bead border on just the front and rear of the pattern. The upper and lower parellell edges are left borderless. 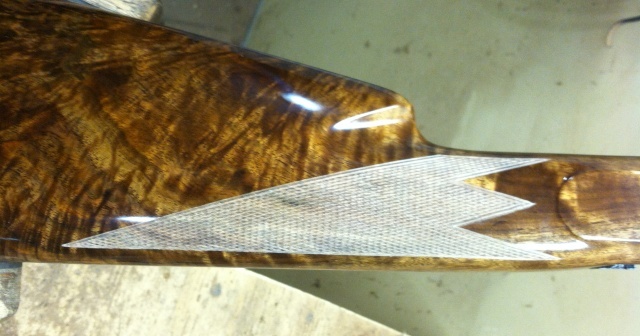 Finally, a coat of penetrating sealer is brushed onto the finished checkering as to darken it and protect it. 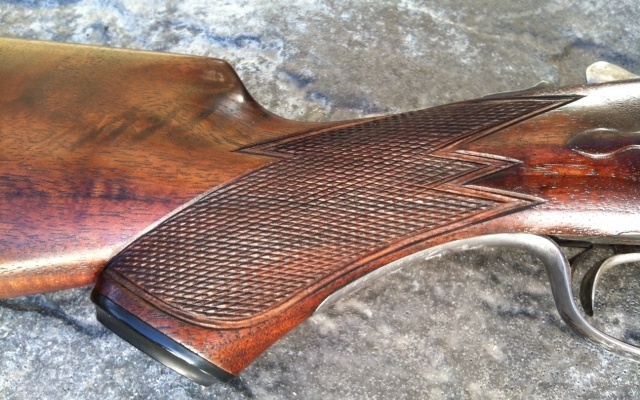 The grain of the wood shows through the checkering and the finished result is a very attractive final touch to a custom stock. 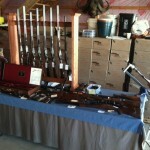 Below are photos of the assembled rifle. This Parker VH has belonged to and was passed down through the owners family since it was purchased new in 1901. It had been used a lot as a working shotgun. The buttstock had been very badly damaged and crudely repaired with screws, tie wrap, etc. 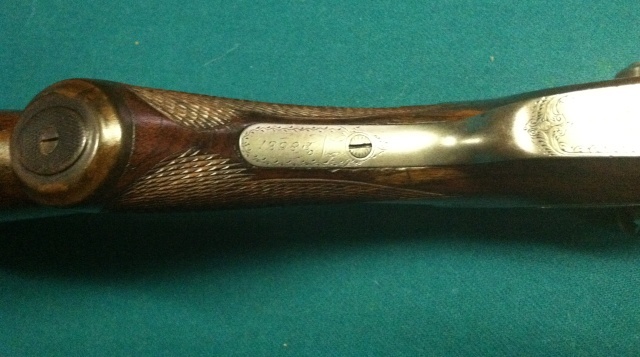 The trigger guard bow had a second screw run through it at the rear that went right through the engraved serial number. 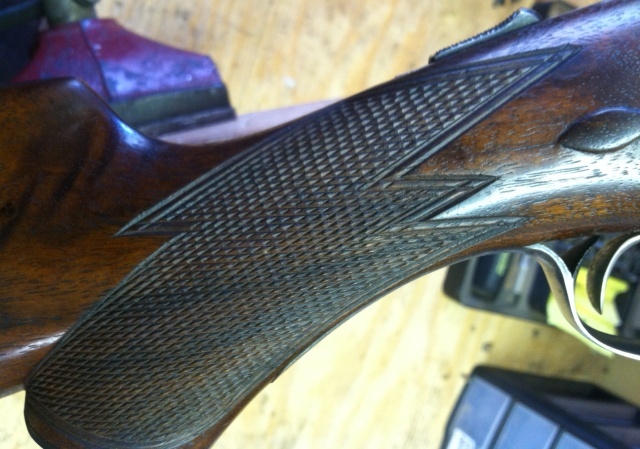 And the forend had a deep 4 inch long scratch running through the checkering pattern. 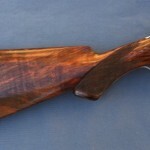 A new buttstock was made using grade appropriate black walnut. The original grip cap, buttplate and stock shield was reused. An original style amber shellac finish tops off the new wood and fresh checkering was cut on the wrist. A replcement guard bow and new screw was used. 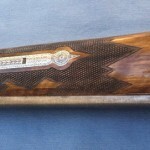 The correct serial number and border engraving was recut by Geoffroy Gournet before being reblued. The damage to the forend was repaired, fresh finish applied and checkering recut to nearly hide the damage that was done. This revived VH can now continue to serve the family it has been in since 1901 and be passed down through ferther generations to come. Restoring a 20g. Parker Trojan “Parts Gun”. We must not always jump to the conclusion too quickly that a gun is only good for Parts. This 20g. Parker Trojan would have been considered just that by many people. It came to me as just a complete action with trigger guard and a set of barrels. 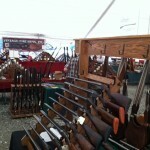 It had no wood at all and the forend iron was completely missing. The metal finish was all plumb patina and many of the action screws were messed up. 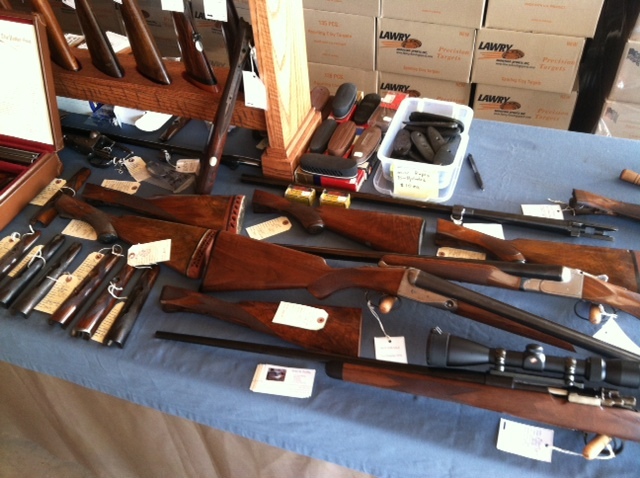 The gun had the advantage of having uncut 28″ barrels with good bores and being a 20g Parker. 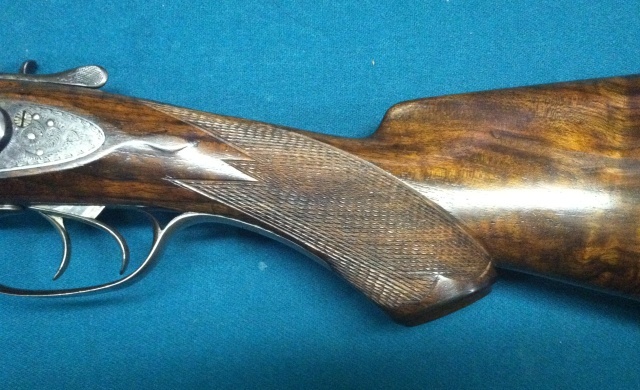 A NOS Parker forend iron had to be fitted to the frame and barrels. A lot of the action screws needed replaced. All new wood was made, finished and checkered. 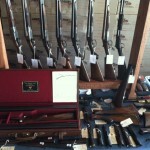 Barrels re blued and action re case color hardened. It was a lot of work, but this “Parts Gun” was restored back to like new condition and waits to be carried in the field for many more years to come. 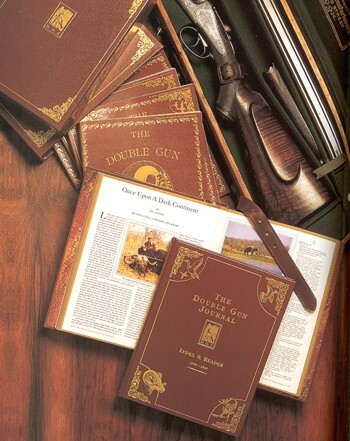 Publishing of Parker article in The Double Gun Journal. The Summer 2013 issue of The Double Gun Journal has been released containing an article I wrote on Parker Brothers’ design engineer James P. Hayes. 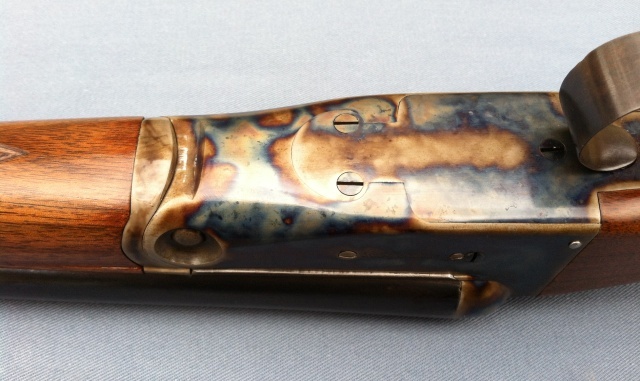 The article profiles Hayes’ career and his work on the Parker Gun and his hand in its design evolution. The primary purpose is to highlight a prototype Parker Trojan that Hayes built in 1928 that had until now remained undocumented. If you are not a DGJ subscriber, and you are a Parker Gun enthusiast, I would recommend purchasing a copy of this issue and giving it a read. 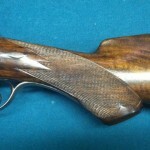 The importance of screws on fine guns. On any fine gun, the details count the most. 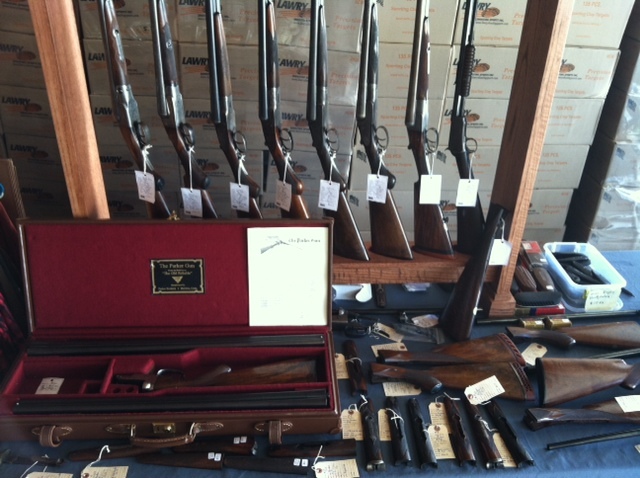 It is what sets them apart from others when it comes to the level of quality put into hand finished guns. 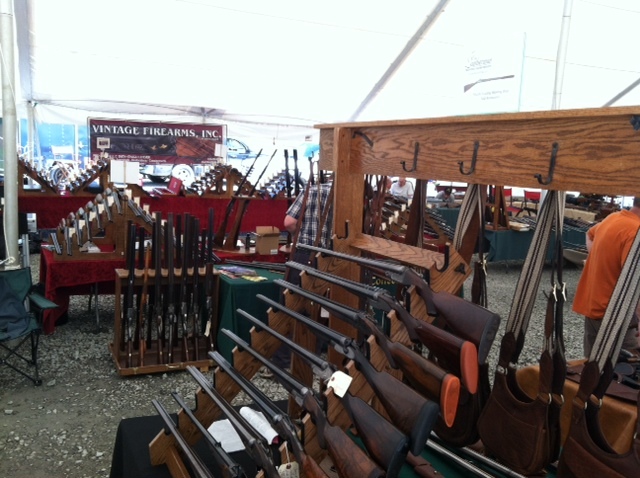 Incorrectly timed or buggered up screw slots on a gun can be a major negative when it comes to value and also the overall condition of a vintage firearm. This Parker VH 20g is a good example of poor screws that have had incorrect tools used on them as well as being out of allignment. This is all too common of a problem on such guns. Two of the Three screws are needing to be replaced. When they were removed, it was found that the two front screws had been switched. The screws are marked from the factory as to where they belong on the gun. When I put the one good screw (upper left in photo) back into its correct location, it timed as it should to point North/South. New screws were then installed, timed and finished down to the other two locations. Finally the addition of some artificial patina and finishing dulls the screw heads down enough to blend into the surrounding metal on the frame. The result is an again attractive and clean trigger plate. Just as the craftsman at Parker Brothers intended. 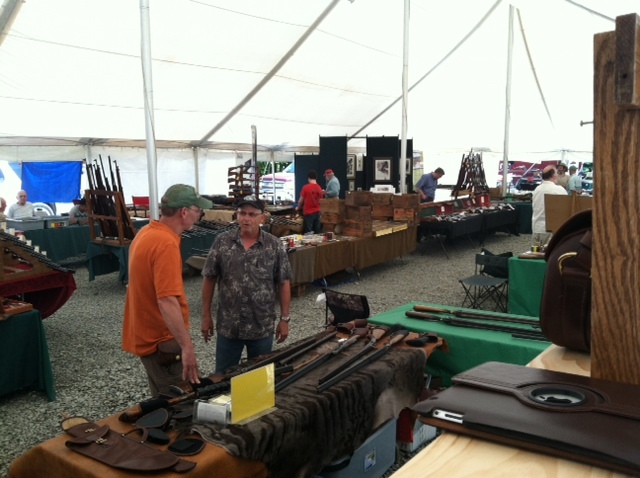 The 2013 Northeast SxS Classic at Hausmans Hidden Hollow was well attended. 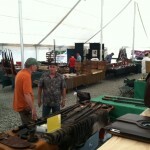 Hundreds of shooters came from all over for three days of shooting events in the hills of beautiful Northern PA. 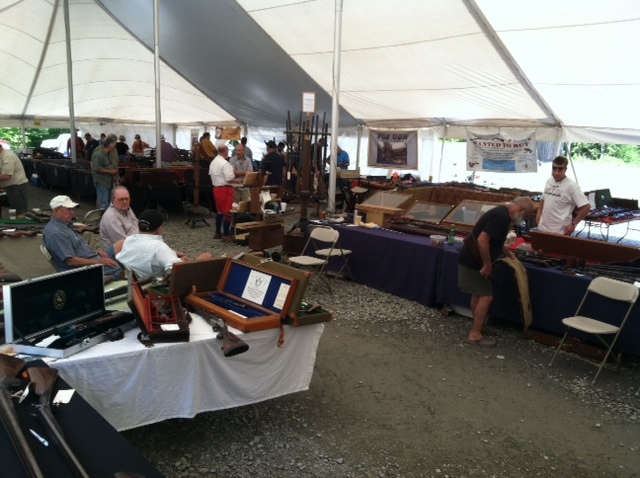 Many vendors exhibited at the show in both the main tent and the barn. 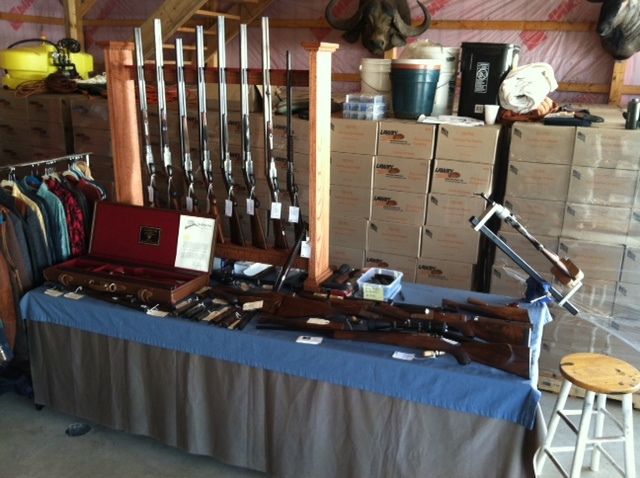 I was set up at a table in the barn and had the opportunity to meet and speak with some great people. 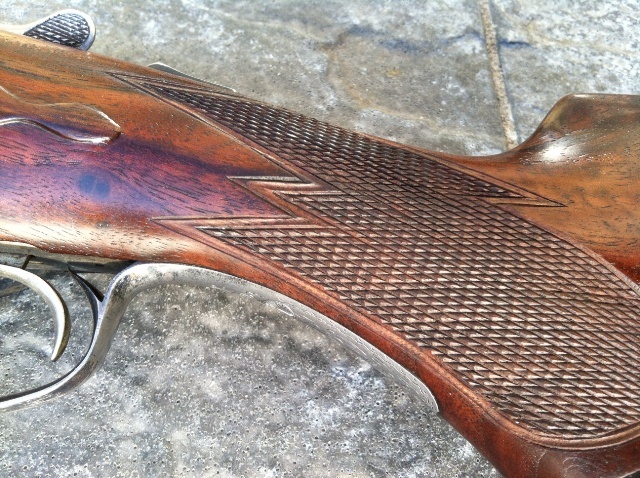 This type of border is found on all grades of Parker guns and the only variation between grades can be some differences in the width of the border. Cutting of these borders today can be accomplished by using a combination of commercially available tools. Or one custom made tool could be fashioned if need be. 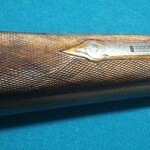 Below are photos of a DH grade Parker that had previously had its checkering recut. The one side lacked any border and had a lot of over-runs. The other side had a very deep single line border. The spacing of the checkering was also too large for the grade of the gun and it was fully pointed which is also not correct. The spacing of the lines cannot be corrected, but all other issues can. 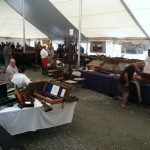 Below are photos of the checkering after correction of these issues. A proper Mullered border was able to be added to the side that lacked a border. This also covered up the over-runs. The incorrect border on the other side was able to be converted to a proper mullered border. 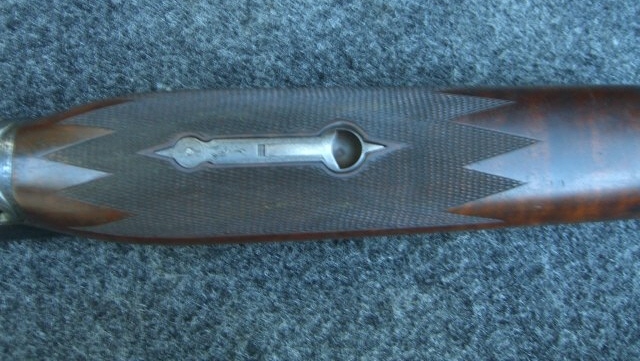 The point pattern was cleaned up in areas that needed attention and the sharp points were burnished down to make them more correct in appearance. 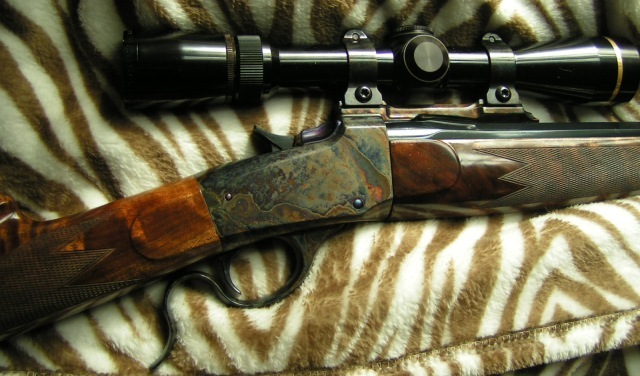 The end result is a checkering pattern that is much more correct for a Parker gun.